P.A. 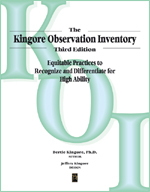 Publishing: Kingore Observation Inventory (KOI), 3rd ed. The KOIs emphasis on differentiation and impacting teacher practice is a major distinction between the KOI and other teacher-centered identification tools. It is unique because of the number of students who benefit from this process. It fosters robust differentiation and support for all learners as it promotes recognition of students with high aptitude or high ability. The KOI provides a common language and economical process that neither disrupts classroom instruction nor demands expensive materials. The Kingore Observation Inventory (KOI) is an equitable process to guide educators search for emerging talents while nurturing all students in kindergarten through eighth grade. This procedure elicits all educators input regarding students in a specific classroom learning environment who may be gifted, potentially gifted, or currently revealing emerging talents. Educators use the KOI to observe the strengths, talents, and interests of all children in order to recognize which students may need intervention as well as more challenging differentiation to experience continuous learning. The format neither disrupts classroom instruction nor demands expensive materials. It supplies a structure to guide educators deeper understanding of what giftedness, high-ability, advanced potential, and emerging talents actually look and sound like in learning environments. The observation process inherently raises teachers awareness of the vast variety of ways that students from a wide range of backgrounds may exhibit advanced behaviors in the same learning environment. The process focuses on observing and documenting students cognitive, noncognitive, and social-emotional behaviors as they respond to differentiated learning opportunities over time. Teachers systematically differentiate instruction to ensure all students have equitable access to advanced learning opportunities. The KOI system of differentiation, observation, and recognition is organized to elicit the myriad of ways students demonstrate unique potential. This system promotes support for all students higher learning opportunities while facilitating recognition of high ability and potential. Over time, teachers purposefully analyze and interpret the results of their classroom observation and differentiation. The intent is to recognize high-ability students in the general population, underrepresented populations, as well as underserved students whose high abilities or advanced potential may be surfacing. Educators then use district norms or the provided holistic rubric to evaluate results and develop recommendations regarding students for whom additional information is needed to guide identification and provide appropriate levels of learning opportunities. Differentiation is the heart of the KOI system. The KOIs emphasis on differentiation of instruction is a major distinction between the KOI and other teacher-centered identification tool, such as checklists or rating scales. The KOI differentiation techniques and open-ended learning experiences enable all students to experience the confidence and self-esteem that results when they succeed with work that is challenging for their development. As teachers recognize emerging talents and potential, the KOI system encourages them to intensify differentiation practices. That differentiation ensures that their students access learning opportunities requiring sophisticated thinking and motivating academic performance at their highest levels of capabilities. Thus, students immediately benefit from opportunities to experience continuous learning rather than treadmill in place with unneeded repetition. All students, including the gifted, have the right to learn at their highest level of readiness.